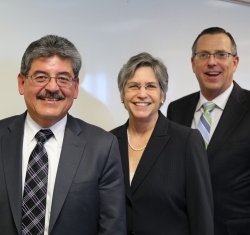 Joint Working Group for California’s Language Access Plan members Judge Manuel J. Covarrubias (left)(co-chair), Justice Maria P. Rivera (co-chair), and Judge Steven K. Austin presented the plan to the council. SACRAMENTO—At its public meeting on January 22, the Judicial Council approved the adoption of a comprehensive language access plan that provides a consistent statewide approach to ensure language access for all limited English proficient court users in California. The Strategic Plan for Language Access in the California Courts is the result of an 18-month effort that included public hearings and a 60-day formal public comment period on a draft of the plan. The language access plan also calls for the immediate formation of an implementation task force, which will recommend and develop ways to carry out the plan in all 58 superior courts. Newly appointed California Supreme Court Associate Justice Mariano-Florentino Cuéllar will chair the task force. Governor’s Proposed Budget for Fiscal Year 2015−2016: The council received an update on the Governor’s proposed state budget released on January 9. The proposal would add $180 million in new funding for the judicial branch in FY 2015–2016. The new funding would help courts further recover from the unprecedented $1.2 billion in budget cuts that began in 2008, which closed 52 courthouses, reduced services statewide, and eroded the public’s access to the courts. Budget Request for More Security Funding: The council approved a recommendation from its Trial Court Budget Advisory Committee to submit a budget change proposal to the State Department of Finance to increase funding for court-provided security. The proposed budget increase is based on a survey of the 39 trial courts that provide their own security instead of receiving this service from their county’s sheriff’s offices. The committee estimates those courts need a total of $2.7 annually to maintain security at FY 2010-2011 levels. Funds for Court-Appointed Counsel in Dependency Cases: The council approved a recommendation from its Trial Court Budget Advisory Committee on a process to reallocate a portion of unused funds for dependency court-appointed counsel to courts with greater need for those funds in FY 2014–2015. Although there is a net funding need statewide, within a fiscal year not all courts are able to spend their entire funding allocation because of changing dependency caseloads in counties, contract negotiations, fluctuating needs for conflict counsel, and extraordinary expenses such as expert witnesses. Council Liaison Reports on Conditions in Individual Superior Courts: The council heard reports from three of its members who visited superior courts in Lake, Mendocino, and San Francisco Counties. The liaison reports highlighted funding challenges faced by those trial courts, which have resulted in closed courtrooms, staffing reductions, and deteriorating courthouses. An archived audiocast of the entire meeting broken out by topic will be available on the January 22 council meeting webpage later this week. Note: The council’s business meeting took place in Sacramento because it was preceded by a day of legislative visits at the state Capitol for council members to meet with legislators and their staffs.